100% vegan and made in La Pasta's kitchen the same way you'd make from-scratch ravioli at home, you're getting handmade craftsmanship in every bite! These delicious dairy-free "cheese" raviolis are quick and easy to prepare - just boil 4 quarts of water, drop your ravioli in, and you'll have them ready in just 4-5 minutes for a meal that's quick and delicious! 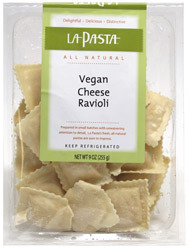 Availlable in either Dairy-Free Cheese Ravioli or Dairy-Free Spinach & Cheese Ravioli, 9 oz. (255g) packages contain around 14 ravioli each. $7.99 per package.. I was fooled by reviews and bought it. It smells like homemade play dough and it tastes like it too. If your used to eating potato as cheese I guess this product is for you, but if your looking for a cheese type flavor this is not for you. From SB of Minneapolis, Minnesota on 8/9/2018 . 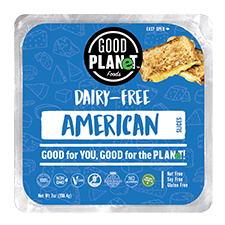 I recently became lactose intolerant, so I have been trying many vegan products. I've tried all the cheese substitutes, and have hated them all (with the exception of Miyokos plain cream cheese). 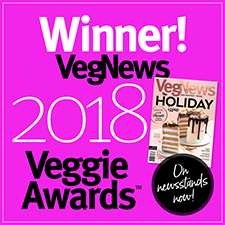 I have also tried other vegan ravioli products, and have not liked them. I REALLY miss the Italian ravioli I used to buy in my local supermarket. I figured I'd give these a shot (original version), and if I didn't like these, I was giving up. Wow! After a couple of bites I had to get up to check the package to make sure I wasn't actually eating a real cheese product! No, it doesn't taste exactly like the real thing, but I have no doubt that if I had let my husband try them, he would never have known the difference. I didn't notice any potato flavor as other reviewers have mentioned. The texture and flavor of both the filling and pasta was smooth and comparable to a non-vegan ravioli product. I will be purchasing these again!! From Jennifer of piscataway, New Jersey on 1/13/2018 . I do remember the ravioli having a more cheesy flavor a couple years back. It did taste more like a buttery mashed potatoes as a filling, but I still loved the flavor. So, yea, keep that in mind when ordering that it does have a potato-like flavor, but I still sensed a tad cheesiness (just less than before). I thought it was going to be daiya cheese, or melted deliciousness. Instead, I got a potato. You know those cheese recipes that are made with potatoes that hardly taste like cheese? This was pretty much it. I had to take the "cheese" out and stuff some daiya in there. It was still too bland. I put some salt and sauce, and it was okay. From Sasha of Fairfax, Virginia on 11/23/2016 . I LOVE this ravioli so much. I got the spinach one and ate the entire package myself. I am going to reorder, price doesn't even matter I was so happy.